If you have questions or concerns regarding this statement, contact: feedback@GotScrap.com. GotScrap.com has security measures in place to help protect the loss, misuse and alteration of the information under our control. All information is stored in a secure operating environment. Employee access to the system is limited to the functionality necessary for each person's job. Relevant employees are informed of our security policies and their access to applications and data on our network. If you still do not feel comfortable about leaving your information on our website, please use the telephone instead by calling 1-800-GOT-SCRAP and we'll be happy to help you with your questions. GotScrap.com uses firewall technology as another layer of protection designed to prevent unauthorized access to or from a private network when connected to the Internet. All data passing into or out of our network must first pass through the firewall. The firewall reviews each piece of data to make sure it meets our security criteria. The firewall blocks any data that does not meet the security criteria. The Storage of Your Information. GotScrap.com stores your information on a database server, which is separate from our Web server. Even in the unlikely event that someone gains unauthorized access to our Web site, they could not access your data. We use the information you provide us in order to contact you either directly of via one of our contractors. Please read the disclaimer on our contractors. 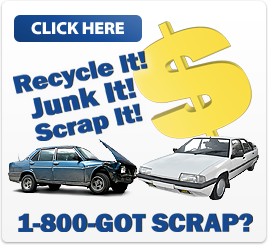 GotScrap.com does not disclose, share or sell personal information, including e-mail addresses, mailing information, telephone numbers, or other Registration Information to third-parties engaged in e-commerce or otherwise. Our normal business activities require us to share your personally identifiable information with a limited number of contractors if you request such. These contractors may use your information in connection with reaching you and doing business with you. Advertisers appearing on this Web site will have access to information about your visits to this site, such as number of times you have viewed an advertisement. This information is used to serve ads to you. In the course of serving advertisements to this site, our third-party advertiser may place or recognize a unique cookie on your browser. We may provide links to third party Web sites as a service to our users. Please be aware that we cannot control and are not responsible for the information collection practices of such Web sites, which may differ from those of GotScrap.com. We encourage you to review and understand the privacy policies on these Web sites before providing any information to them. Remove you and your personal information from our database, thereby canceling your ability to receive e-mails and marketing from us.